Following the detention of staff from Turkey’s Cumhuriyet earlier this week the paper is reporting that nine individuals, including editor-in-chief Murat Sabuncu and political cartoonist Musa Kart, have appeared in court. The Associated Press’ reporting of this latest development is being carried by various news sites, such as Dawn and Salon. The ruling formalises their arrest, meaning they will be jailed pending a trial. The exact nature of the charges is not yet clear but it is worth noting that these arrests come amid a widespread crackdown in Turkey against alleged enemies of President Recep Erdoğan, pro-Kurdish organisations and opposition politicians in particular. Erdoğan has made public promises to bring back the death penalty for those found guilty of treason. Leading press freedom organisations including IFEX, CPJ and PEN International have made a joint declaration on the Cumhuriyet situation and this week’s events in Turkey. CRNI endorses it wholeheartedly. Musa Kart is an internationally renowned cartoonist and this arrest is merely the latest in a series of grievous impositions placed upon him by the Erdoğan regime. In 2005 he was the recipient of our Courage in Editorial Cartooning Award when he was first sued for ‘libel’. 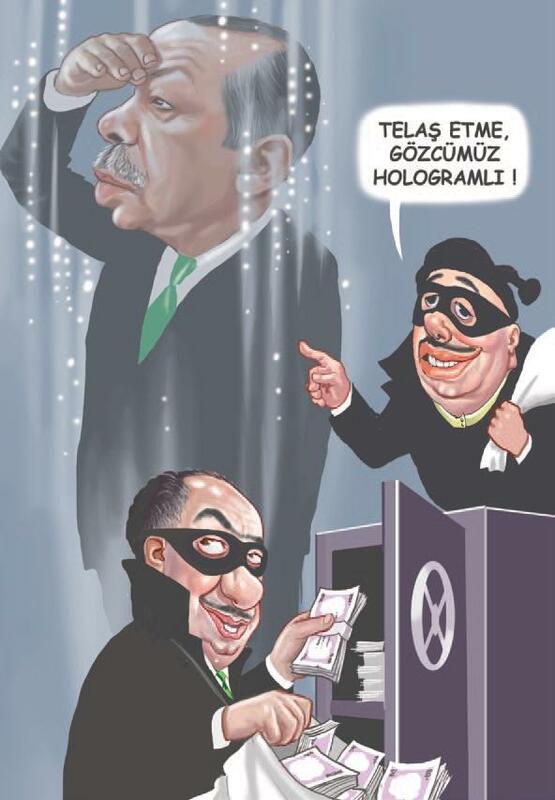 In 2014 cartoonists everywhere used the hashtag #caricatureerdogan to show their support when he again stood trial for ‘slander’ over a cartoon in Cumhuriyet (below). His peers are once more drawing in solidarity with Musa, as can be seen at the Cartooning For Peace and Cartoon Movement sites.